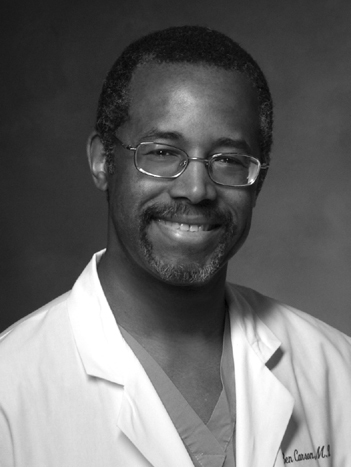 Benjamin Solomon Carson retired in 2013 from Johns Hopkins University, where he had served as director of pediatric neurosurgery for nearly thirty years and was a professor of neurosurgery, oncology, plastic surgery, and pediatrics. Among dr. Carson's groundbreaking achievements was the first successful separation of Siamese twins joined at the back of the head (1987). He also co-developed a pediatric craniofacial surgery program, combining both neurosurgery and plastic surgery procedures, significantly decreasing the time in surgery and risk to the patient. Born in Detroit, he grew up in a single-parent home in the inner city. His mother, Sonya Carson, who had only a third-grade education, insisted that her children read and study. Under her influence, Benjamin Carson excelled, graduating from high school with honors. He majored in psychology at Yale University and received a medical degree in 1977 from the University of Michigan Medical School. Dr. Carson has been awarded numerous honors, including more than 30 honorary doctorates. In 2001, the Library of Congress named him one of its Living Legends. He is president and co-founder of the Carson Scholars Fund, which awards college scholarships to students of diverse backgrounds who demonstrate academic excellence and community service. He is also president and co-founder of the Benevolent Endowment Network (BEN) Fund, which makes grants to families for certain types of medical expenses. In 2015, Dr. Carson ran in the Republic Party presidential primary but suspended his campaign to endorse Donald Trump as the party nominee. After winning the national election, Trump offered Carson the cabinet position of secretary of housing and urban development. Johns Hopkins Medicine: Benjamin Solomon Carson, Sr.